This legendary hamburger is a construct of simple ingredients, but until now no one has succeeded in creating a perfect clone recipe—most likely because they miss the subtleties that make this 70-year-old recipe so great. If there is such a thing as hamburger perfection, In-N-Out Burger has achieved it. The 330-unit West Coast family-owned chain learned a long time ago that if it ain’t broke, don’t be fixing. Which means the menu today looks nearly the same as it did at the first In-N-Out Burger in Baldwin Park, California over 70 years ago. With the exception of the not-so-secret “secret” menu, there are very few decisions to make from the limited choices of a hamburger, cheeseburger, Double-Double, fries and drinks. It’s this simplicity that pins In-N-Out Burger to the top of every “Best Hamburger” list—a testament to doing just a few things, and doing them really well. The first choice on the menu is the chain’s signature, the trademarked Double-Double which comes with two beef patties and two slices of cheese, and a whole onion slice stacked between them. There are lots of secrets to share with you regarding the construction of this amazing burger: the crispiness of the buns, the size of the relish, the best beef to use, how to make a burger “smile”—details that, on their own, seem trivial. But put all of these tricks together in one burger, and you’ll be surprised by how much the little things matter. The majority of clone concoctions for the In-N-Out spread that I’ve seen call for sweet pickle relish, and you should steer clear of those recipes. Hacky hackers assume that all pickle relish in burger sauces is sweet pickle relish, but that is not the case. After running the spread through a fine-mesh strainer and tasting the leftover green solids, it was clear that the relish was not sweet at all, but sour and tart. It wasn’t hard to conclude that the spread at In-N-Out is made with dill pickle relish, and that is why traditional sliced dill pickles are absent from the burgers on the menu board. That would be dill pickle overkill. Also, the size of the pieces of chopped dill pickle in the relish are very small. Much smaller than the pickle chunks in the bottled relish you buy at the store. That means you must finely mince the relish out of the jar, before adding it to the spread, to get the same ratio of sourness in each bite as the original burger. And while you’re in mincing mode, mince up that onion super fine as well. Once you’ve minced the relish and onion, combine them with the other ingredients for the spread: mayonnaise, ketchup, mustard, vinegar, paprika and salt. Stir this up in a small bowl, then give it some alone time. Just as the quality of chocolate and vanilla determine the quality of your chocolate chip cookies, the ground beef you use in your hamburgers matters a lot. The beef patty is the star of every hamburger, and it can make or break a good recipe. In this case it’s a double bill, so the ground beef is an especially important component. One big reason In-N-Out’s beef tastes so good is its high fat content. It’s higher than the 20% fat most commonly found in pre-ground chuck from your local butcher. Ideally, you want beef that is 25% to 30% fat, and that means you’ll need to grind your own (or have a butcher do it). If you have a Kitchen-Aid stand mixer, all you’ll need is an attachment, and it’s well-worth having. It’s nice to be in charge of what goes into your ground meats. It will be hard to tell what the fat percentage of your home-ground beef is, however, but if it looks like the photo above, it should be just right. If you start with a well-marbled chuck roast, there’s a good chance your freshly ground beef will be in the recommended fat ratio ballpark. If you don’t have a meat grinder, and are not planning to get one just because you found a cool hamburger hack on the internet, then get pre-ground chuck with an 80/20 meat-to-fat ratio. In-N-Out uses fresh, never frozen, beef patties. Judging by the final cooked weight of the patties, the beef portions start at around 2 ounces. To get the perfect final cooked size of In-N-Out’s patties you must start with circles that are 4 inches across. Press the ground beef onto wax paper, then place another piece of wax paper on top until you are ready to cook ’em. When you bite into a fresh hamburger from In-N-Out, you will experience what I call “The Crunch.” It comes from very well-done toasted bun faces that are practically cracker-crisp by the time they get pulled off the grill. “The Crunch” is not a sensation that you will get from other chains where the hamburgers are wrapped tightly and stacked under a heat lamp. The trapped moisture in those burgers quickly steams away any pleasant crispiness from the bun. To prevent that, an In-N-Out burger is never fully enclosed in its wrapper. “The Crunch” is easy to replicate by placing the faces of ungreased buns down onto a pre-heated pan over medium/low to medium heat. Check the buns periodically to see how they’re doing. You want them to be at least as dark as the photo above, and a little darker is even better. Achieving “The Crunch” will take longer than the 4 minutes it takes to cook the burgers, so start with the buns a few minutes before cooking your beef patties. And use the freshest, highest quality buns you can find. Pre-heat another pan over medium/low to medium heat. Since every stove heats differently it’s difficult to specify exactly where your knob should be set for this step. You’ll have to figure that out for yourself after inspecting the first cooked patty. If the beef has a nice dark brown crust on it when flipped after cooking for exactly 2 minutes, then your temperature is just right. Keep it there. If not, then adjust accordingly so that your patties are perfectly browned after 2 minutes. Also, In-N-Out burgers are quite salty. Add a generous shaking of salt and just a pinch of coarse black pepper to both sides of each patty as they cook. I’m stoked to have discovered this particular insider secret, because it cleared up a misconception I’ve had about these burgers for over 25 years. At first glance of promotional photographs of the Double-Double, it’s easy to assume that there are 2 slices of American cheese on top of each beef patty, since the front-facing edge of the cheese is double-thick. That’s why I incorrectly called for 4 slices of cheese in my original hack of this recipe for my first book, Top Secret Recipes. That always felt wrong—4 slices is excessive and it’s not called a Double-Quadruple—but the visual of the folded cheese threw me and I made the wrong call. This confusion was recently cleared up when I discovered that the chain teaches its workers to “make the burgers smile” by folding the cheese over itself a little bit at the front. Approximately one-quarter of the cheese is folded and then placed, folded-side-down, onto the beef patty. But rather than placing the cheese in the middle of the patty, it’s positioned so that the edge of the burger patty is exposed, making it “smile.” It’s like how you show your teeth when you smile, but in this case the beef is the teeth. When fully assembled this exposed edge of the beef patty makes the finished burger look more appealing, and the first few bites are extra cheesy. When you add the folded cheese slices to your patties once you flip them (add salt and pepper first), be sure to leave about 1/2 inch of the patty uncovered. And for God’s sake, don’t use the individually wrapped cheese food slices, like Kraft Singles. That is not real cheese and it will ruin your otherwise perfect burger. Get real American cheese and erase Kraft Singles from your shopping list forever. Once you place the cheese add a slice of onion on top of one patty and a well-toasted bun on top of the other. 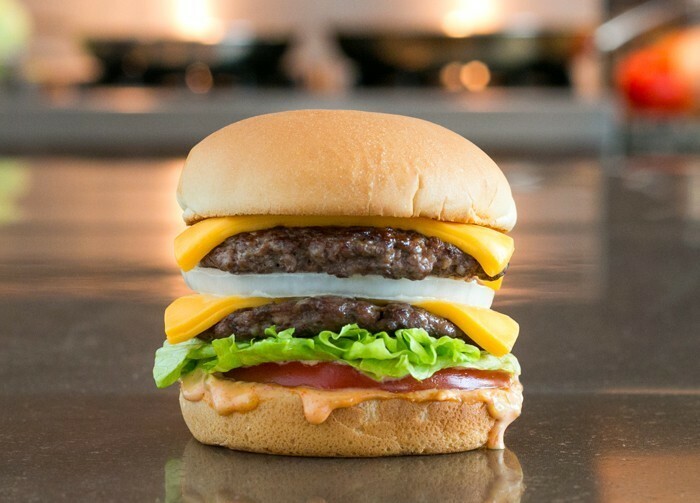 While these patties cook for 2 minutes, you’ll need to build the bottom of your masterpiece. Add a slice from a perfectly ripe tomato that is about the same diameter as the bun. Tear off some iceberg lettuce and squish it gently into the palm of your hand to compress it a bit. They do this at In-N-Out so that the lettuce doesn’t make the burger too tall to fit into the wrapper. Squishing a burger down after it’s assembled is a big no-no, because it will compress the fluffy buns and squeeze the spread right out of the stack. Now we’ll gather up the hot stuff that goes on top. Use a spatula to stack the top patty with the bun onto the bottom patty with the onion. Is your cool stack nearby? Hope so. Slide the hot half of the burger onto the cool half and serve it right away. These burgers are best when eaten immediately. For a final touch I bought some sandwich paper at Smart & Final and wrapped the burger in it before serving. You can also do this with wax paper. Before you wrap paper around the burger, fold over an inch or so at the top to give the paper a nice edge, just like the pros do. Here’s the entire stack for a perfect In-N-Out Double-Double hack. Follow the instructions exactly as described and you’ll make one of the best burgers to ever come out of your home kitchen. Fresh ingredients, the perfect spread, moist beef patties and a welcoming crunch on first bite—that’s what a great hamburger’s all about. This legendary hamburger is a construct of simple ingredients, but until now no one has succeeded in creating a perfect clone recipe—most likely because they miss the subtleties that make this 70-year-old recipe so great. There are lots of secrets to share with you regarding the construction of this amazing burger: the crispiness of the buns, the size of the relish, the best beef to use, how to make a burger “smile”—details that, on their own, seem trivial. 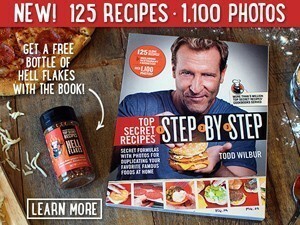 But put all of these tricks together in one burger, and you’ll be surprised by how much the little things matter. Make the spread by combing all of the ingredients in a small bowl. Set this aside until needed. Make eight patties by rolling 2-ounce portions of beef into balls and forming them into 4-inch circles on wax paper. Preheat two large sauté pans over medium/low to medium heat. Start at medium/low and then turn up the heat if needed after 5 minutes of pre-heating. To prepare each burger, separate a hamburger bun and place the face of the top and bottom bun on one of the hot pans to toast. The buns are done when the faces are significantly darkened and crispy. Cook the beef by placing two patties in the other hot pan. Add a generous sprinkling of salt and a pinch of coarse ground pepper. Cook for 2 minutes, then flip each patty over and salt and pepper each one again. The beef should be nicely seared. Immediately after flipping the beef add a slice of American cheese on top of each patty. Before adding the cheese, fold about one-quarter of it over and place it onto a patty with the folded side underneath, but offset so that about 1/2-inch of the beef patty is showing where the cheese is folded. This gives you the "smile." Place the toasted top bun on top of one of the burgers and the sliced onion on the other. Cook the patties for another 2 minutes. While the patties cook, prepare the bottom of the hamburger by adding about 1 1/2 tablespoons of spread onto the face of the toasted bottom bun. Stack the tomato slice on next. Pick up a small handful of lettuce and press it into the palm of your hand to compact it so that the hamburger isn't too tall, then add it on top of the tomato. When the patties are done, use a spatula to stack the top patty (with the bun) onto the onion on the second patty. Use your spatula to move this whole stack off the pan and onto the bottom of the sandwich. Wrap the burger with wax paper or sandwich paper, if you like, and serve. Very interesting! What temperature would you recommend in fahrenheit or celius for cooking the patties? I’m at around 250 celius. It’s a bit sacrilegious but I would assume that they have compromised on the patty size to save money. Do you think their size is optimal or ideally the patties should be slightly bigger? Connie and I have practiced the Double-Double and about have it down to perfection. Have only done for 4 people (including us) so far. We bought an extra griddle for the stove and she does the buns and the cold side and I do the hot side. Buns are first to reach that crispy edge. Then I get the tops and she sets up the bottoms with the sauce, lettuce and tomato. I get the patties going and add the folded over cheese and onion. I place the tops onto the bottoms. We immediately wrap them and place in a burger sleeve. We found some burger sleeves on Amazon and cut them down to fit and the waxed paper is that really thin kind that comes out of the box in individual sheets. We are displaced Californians living in NY so have no access to In-N-Out. Closest we come back here is Shake Shack but gotta go into the city for that. This Saturday we are having some friends over for DD’s. She is also a displaced Californian who also has those fond memories. Yes!!! I don’t have In-n-Out where I’m from, this is great! If you read the whole Hack, you would realize that there really is “real” american cheese. Sure, it is a cheese product but is made with quite a bit of real cheddar. It is best to get it in the deli and have it sliced. The whole point is that this is the best thing to be on and In-N-Out! Can you imagine putting an aged cheddar on a double double.? Ridiculous! As the hack says, this is the time to forget you ever heard of Kraft or Walmart singles. Sliced in the deli. That’s it! Seems kinda funny to talk about “real” American cheese, since “American cheese” isn’t cheese in the first place. Hi Todd, I live overseas and can’t get my hands on dill pickle relish. I had some hot dog relish (dill) shipped to me and was wondering if you could sub that for relish and also leave out the mustard since hot dog relish has mustard already in it. Thoughts? Do like I do and give it a try. That’s the best way to find out! Let me know how it goes. Tried it tonite and was absolutely awesome! Need to make a couple of tweaks: We had griddle too hot. Need to figure out the surface temp for “med”, or “med lo” actually is. We have one of those heat sensing guns and will check it out. This is from 2 native Californians who chose to move to NY 10 years ago and the only 2 things we really miss is In-N-Out and Costco. We are 2 hours from the nearest Costco.. This looks good, but I’m stumped by the dill relish. Some In-N-Out clones call for dill relish, some call for sweet. Since I can’t get my hands on an In-N-Out burger, I called customer service to ask which they use. The representative said the ingredient information indicated sweet relish. It’s definitely dill relish. If you strain it out of the sauce and taste it you can easily tell it’s not sweet. When your operation spans many Western states and numbers over 340 individual restaurants, all owned by the original Snyder family, whatever food supplies you need, you get. In other words, the relish is a custom made just for In and Out product. Sweet relish has alum to crisp it up. Sour dill relish does not and real kosher dill pickle relish is fermented to create the lactic tang. I’m gonna bet the In and Out relish is a lower sugar, cooked vinegar product with added alim for crispness, made by one of the big producers to In and Out specs. Todd’s hack will get you there as expected. Todd, It’s time to hack the Smashburger and nail the smash technique. BTW, If you grind your own burger or even pat your own patties, ya got to keep the meat really cold (soft frozen cold) so the fat doesn’t melt or shmear until it hits the hot pan. What is “real” American cheese?? #Amazing! Keep up the great work! This is SPOT ON! plane while we fly home… Can you imagine the people smelling our lunch!!! Now I can try to get that taste in my home…My mouth is watering!!! Thanks Todd!!! Nope. Too much onion. 2 tablespoons of minced onion is too much. Try it. My sieve test revealed more onion than relish in the spread. Glad you finally figured out to use dill relish. I’ve been making this for the last 10 years. Yes I sat there tasting till I finally got it right. I use Lawry’s seasoned salt on the burger.